AMD’s Ryzen+ CPUs have arrived and if you’ve read our Ryzen 5 2600/2600X or Ryzen 7 2700/2700X reviews, then you’ll know there’s a lot to like. Indeed, one of the great things about AMD’s new family of processors is that you might not even have to buy a new motherboard to start using them, as every Ryzen+ chip will happily slot into every existing AM4 socket motherboard that’s currently available. That’s good news for anyone wanting to save a bit of money during the upgrade process, but those erring toward the higher end of AMD’s Ryzen+ spectrum, particularly anyone considering the Ryzen 7 2700 or 2700X, may also want to think about getting one of AMD’s new X470 chipset motherboards instead – like MSI’s rather nippy X470 Gaming M7 AC, for example. Part of the X470’s chipset’s charm is that it not only supports Ryzen+ out of the box (saving you having to do a tiresome BIOS update on any existing AM4 board you might have), but it also comes with AMD’s StoreMI acceleration tech free of charge – provided you remember to download the software from AMD’s website, of course. The chief benefit of StoreMI is that it can turn any SSD / HDD combo into one giant drive with SSD-like speeds. It does this by automatically moving your most used files to your SSD, while shunting your least accessed files over to your HDD. It adapts to your PC usage over time, too, changing the location of where your files are stored depending on how much you use them. This is fantastic for anyone who’s ever lamented the cost of high capacity SSDs, as StoreMI means you can carry on using your considerably cheaper (and no doubt larger) HDDs and still get the speed benefit of whatever SSD you currently have installed, whether it’s a regular 2.5in drive or a super-fast NVMe drive. Even better, you don’t have to worry about reinstalling Windows or making a RAID configuration to get it working. For the sake of fairness when testing different motherboards, though, I conducted all my tests without StoreMI in effect, just to keep things even-stevens. So what makes the MSI X470 Gaming M7 AC stand out from something like the Asus ROG Strix X470F-Gaming I reviewed last week? Well, it’s more expensive for starters, costing £215 / $230 instead of £185 / $215. That’s not a huge difference, all told, especially in the US, and if you’re into your overclocking then the M7 AC certainly goes a long way to make that extra £30 / $15 count. Its four DDR4 DIMM slots, for instance, still support up to 64GB of RAM, but each one can be overclocked up to a massive 3600MHz when you engage its A-XMP OC mode, making it a better companion for high performance RAM. By comparison, the Asus ‘only’ went up to 3466MHz, which is still pretty damn fast, but those after the ultimate RAM performance will be better catered for with the MSI. The M7 AC’s PCIe expansion slots have a more sensible layout, too. Like the Asus, you get two steel-reinforced PCIe 3.0 x 16 slots that run at full speed in solo use or x8 when both are occupied, and a single, non-reinforced PCIe 2.0 x 16 slot down the bottom that runs at x4. That’s all pretty much the same as Asus’ X470F-Gaming. Instead, it’s the three PCIe 2.0 x1 slots the M7 AC gets right, as here you don’t lose the top slot when you stick your graphics card in, giving you more room and flexibility when it comes to adding additional things like sound cards, extra USB or Thunderbolt add-in cards or additional M.2 or SATA adaptors (you won’t need a network card here as it already comes with built-in 802.11ac Wi-Fi). Admittedly, you’ll still lose the bottom PCIe x1 slot if you decide to take advantage of its two-way Nvidia SLI support or three-way AMD CrossFire support for multi-GPU setups, but that still gives you one more to play with compared to the Asus. You also get the benefit of two heatsinks for your potential pair of NVMe SSDs on the M7 AC instead of just one on the Asus. These are hidden under the rather snazzy MSI-emblazoned prong-like claws that sit snugly between the PCIe x16 slots – snazzy not because there’s a dragon on it, but because the whole thing lifts up via a simple, classy hinge on the right hand side. Yes, I’m being swayed by a hinge of all things, but at least it means I don’t have to worry about losing bits of plastic down the back of my PC case or run the risk of my cats making off with them when it’s time for a bit of SSD installation. It’s just a nice bit of design, and it’s a shame MSI didn’t lavish the same kind of attention on its I/O cover. Not only do you have to faff around with fitting an I/O shield – which is one of my least favourite bits when building a new PC – but its boxy cover just doesn’t look as smart or sophisticated as the pre-mounted one you get on the Asus X470F-Gaming. It’s also worth noting that if you have a second NVMe SSD installed, then the third PCIe x16 slot becomes unavailable. It’s unlikely this will affect most people, but anyone with two NVMe SSDs that also want three-way Crossfire will have to look elsewhere. The M7 AC is a bit disappointing on the RGB front, too, if that’s your bag. 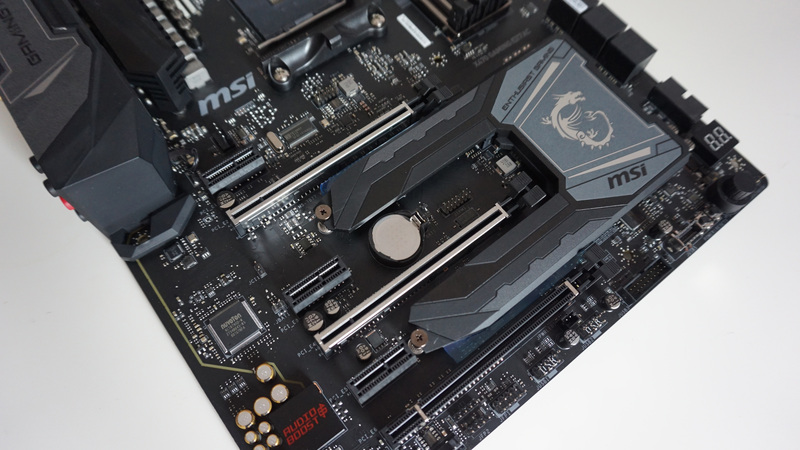 While you still get two RGB LED connectors on the board itself, all that actually gives you are two thin slashes either side of the Gaming M7 logo on the I/O cover and a row of eight LEDs round the back that don’t really make much of an impact – at least not compared to the X470F-Gaming’s large RGB-ified ROG logo. Still, at least there’s another addressable RGB connector for hooking up another LED strip elsewhere in your case, and Corsair aficionados even get a dedicated header for a Corsair-branded fan hub or additional Corsair lighting strips. Elsewhere, you’re looking at six fan headers, six SATA ports, one USB 3.1 Gen 2 connector for the latest USB speeds, plus two USB 3.1 Gen 1 connectors and a single USB 2.0 connector. 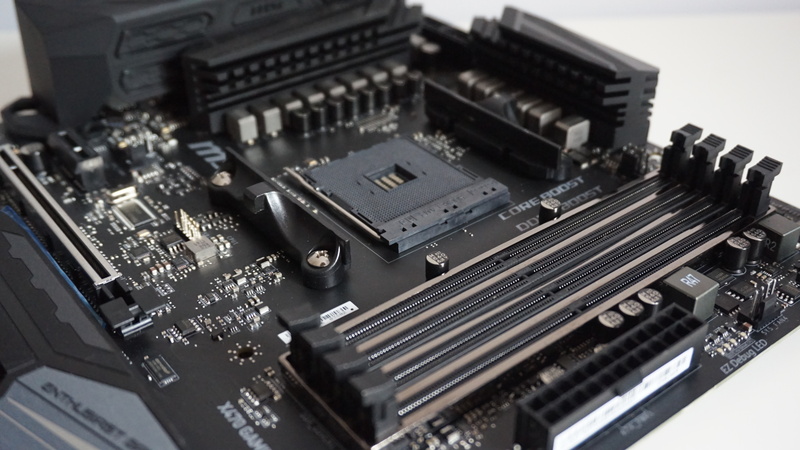 Where the M7 AC really comes into its own, however, is its friendly overclocking features. If you’re the type who tends to work with an open case, you not only get dedicated power and reset buttons, but you also get a handy numbered debug display for easy troubleshooting and MSI’s rather swish Game Boost knob (both pictured below). The latter will still need activating in the BIOS settings, but once enabled it will automatically adjust both the frequency and voltage of your CPU to one of seven predefined levels without ever having to noodle about in your BIOS ever again, making it even easier to get the best out of your new CPU with the least amount of effort. I’m all for this kind of ease and simplicity when it comes to boosting the power of my PC components, especially when this is a motherboard that’s clearly been built for getting the best out of games. Again, in the interests of fairness, I kept the Game Boost knob in its default 0 position during the course of my testing, but even when I paired it with the same batch of components (a Ryzen 7 2700X processor, 16GB of G.Skill Sniper X RAM running at 2133MHz, an Nvidia GeForce GTX 1070Ti graphics card and a Samsung 850 Evo SSD), the MSI was still miles out in front of Asus’ X470F-Gaming in most of my benchmark tests. In 3DMark’s Fire Strike, for example, the M7 AC posted an impressive result of 16213 compared to the Asus’ 15533. In the X470F-Gaming’s defence, its graphics and physics results were actually nigh-on identical to the MSI, so it’s not like Asus’ board won’t do a good job at getting the best out of your graphics card. When you look at Fire Strike’s combined test, however, the MSI was almost 5fps ahead of the Asus (30.85fps compared to 26.00fps if you want numbers). Again, that’s not a massive margin, but in some situations that’s enough to make all the difference between something that’s playable and something that’s a juddery mess, especially around the 30fps mark. The M7 AC performed well in PCMark 10, too, earning an overall score of 5665, with particularly high marks in the productivity and digital content creation tests. These measure office application performance and demanding tasks like photo and video editing, and the M7 AC royally trounced the X470F-Gaming in both categories, coming in 26% faster in productivity and 38% quicker in digital. 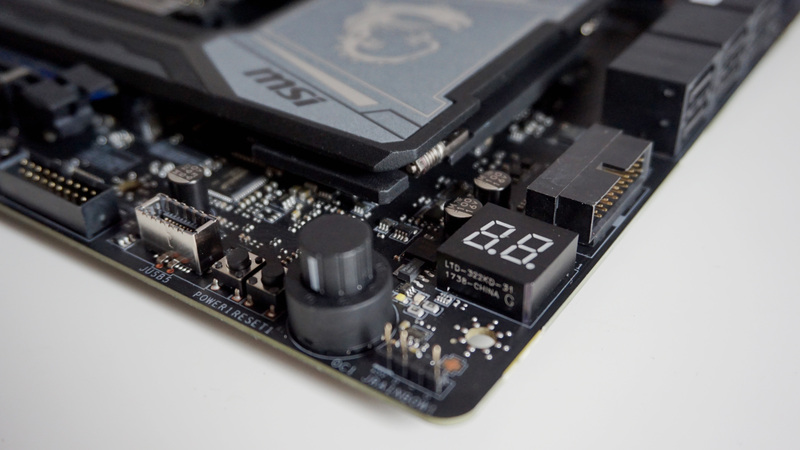 The M7 AC had the edge on SATA performance too. In AS SSD’s random 4K test, its read speed of 41.27MB/s was, admittedly, only 6% quicker than the Asus, but its write speed of 93.58MB/s was 18% faster. I can’t say I noticed much difference in day-to-day use, all told, but at least in theory it helps justify those extra pounds and dollars you’re going to be spending on it. Bizarrely, the M7 AC actually fell behind its Asus rival in both Geekbench 4 (scoring 4561 and 24168 respectively in its single and multicore tests compared to the X470F-Gaming’s 4607 and 25126) and Cinebench R15. Here, the MSI finished with results of 173 and 1750 in the single and multicore tests, while the X470F-Gaming managed 174 and 1771. This is surprising considering how well the M7 AC did in PCMark 10, but even if its everyday performance isn’t quite as swift as its PCMark scores might lead us to believe, there’s no denying the MSI has the edge when it comes to gaming. It’s not going to revolutionise the way you play games, of course, but combined with its easy overclocking tools and only marginally more expensive price, and it should definitely a key contender for the Ryzen+ powermonger. 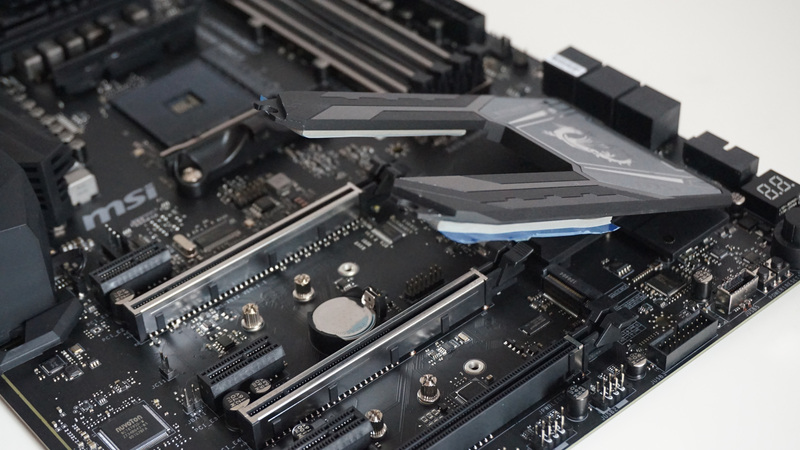 The Asus X470F-Gaming is still a fine choice for those more concerned with keeping costs down or getting their daily dose of RGB, but overclockers will likely have a much better time with the MSI X470 Gaming M7 AC.